The most interesting conferences surface a mix of the ideas that are new enough to be interesting yet mainstream enough to be actionable with those that are just on the horizon. 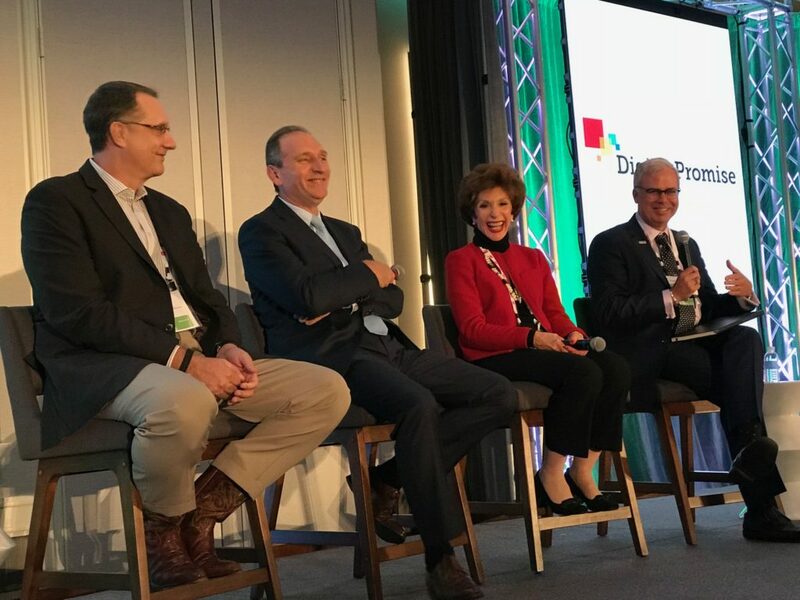 I attend a lot of conferences, so it was with particular pleasure I was able to participate in the inaugural Fusion conference, co-hosted by EdSurge and Digital Promise and focused on Personalized Learning. Not only were both sets of ideas well represented (and the tired, interesting-three-years-ago ideas notably absent), but the conference itself had a fresh take – Personalized Conferencing. From the “fishbowl panel” where audience members were invited to join panelists on stage to the “popcorn questions” where audience questions drove the final plenary session, the conference was full of ways to make the audience part of the program, not just recipients. One particularly effective technique was to split the attendees into cohorts and give them a structured environment to deeply discuss the areas of personalized learning that were of the most interest. The conversations were very high caliber as the participants took center stage. What I found most interesting in participating in this conference were the ideas that are just verging on mainstream. Agency and scale are near and dear to my heart, but have been elusive in the past – with this conference they were brought front and center in nearly every cohort discussion and plenary I attended. The fundamental problem is that in most top-down implementations of agentic pedagogical approaches (those that foster student agency), the teachers are treated as cogs in a machine and are not, themselves, given the agency that they are expected to pass on to their students. In our practice, we activate student agency by activating teacher agency – simple tools and processes that give teachers control of bottom-up change rather than being the objects of top-down change. If we truly want agency and scale, it is time to trust teachers. It was inspiring to see that the issues of agency and scale are widely becoming top of mind among education leaders who are focused on personalized learning. Personalized conferencing gave me the opportunity to advance my own thinking on the topic through discussions with insightful education leaders. I hope to see more of this kind of conferencing in the future. What is Agentic Learning and Why is it Important?